Growing up, my sister and I always gave my dad crappy ties and handmade “art” for Father’s Day. When Quinn was born, I figured I should step up my game and give a decent Father’s Day gift. But what do you give a new dad for his first Father’s Day? “Stuff” like golf accessories, grilling tools and beer goodies just seemed insincere and irrelevant, plus he already had tons of that stuff. 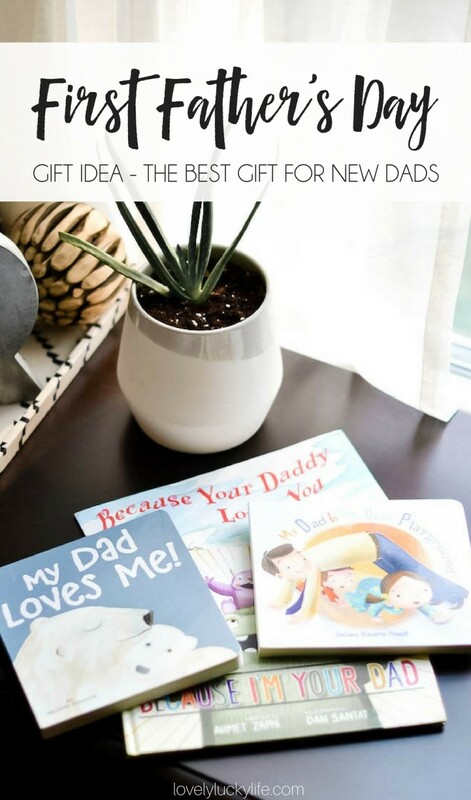 So I had a great first Father’s Day gift idea that was easy, inexpensive, and meaningful… A collection of “daddy books”. What’s a daddy book, you ask? Just a kid’s book featuring a Dad as one of the main characters. Daddy Kisses – the animals are beautiful and this book is great for little guys or gals. Daddy Hugs – Karen Katz books are really sweet and interactive. Just Me & My Dad – I remember reading the Little Critters series when I was a kid. This story is about a dad helping the child and Quinn always giggles at the drawing. I Love You Daddy – this one is about bravery and the daddy encouraging his little bear. “Brave” is a huge word in our house right now! Mighty Dads – Coop loves this one about dad and son construction vehicles. What’s your favorite Father’s Day gift to give? Be sure to check out more gift guides before you go!